TURKMENISTAN TO DISMANTLE GOLDEN STATUE OF DEAR LATE LEADER……. – The Tundra Tabloids……. 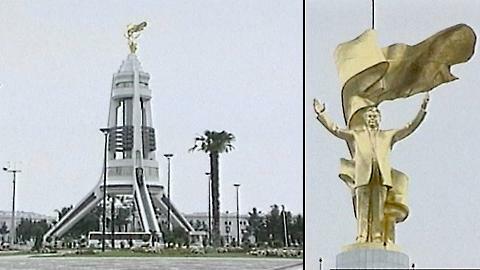 TURKMENISTAN TO DISMANTLE GOLDEN STATUE OF DEAR LATE LEADER……. ASHGABAT, TURKMENISTAN — Turkmenistan will take down a tower topped by a golden statue of the Central Asian nation’s former dictator — the latest attempt to dismantle the late leader’s personality cult. President Gurbanguli Berdymukhamedov ordered the work to begin in March, according to a decree Monday in the state newspaper Neutral Turkmenistan. The Arch of Neutrality — a 230-foot (70-meter) white tile-clad tripod crowned by a statue that rotates to face the sun — was the most distinctive monument built in honor of Saparmurat Niyazov. State media said the president made the decision to dismantle the tower to improve the urban design of the former Soviet nation’s capital city, Ashgabat. However, the move seems to fit in with a general policy of gradually toning down references to Niyazov and his legacy. Niyazov — who renamed himself the Great Turkmenbashi, the “Father of All Turkmen” — died unexpectedly in late 2006 after two decades of iron-fisted and often eccentric rule that made Turkmenistan one of the world’s most isolated and repressive societies. Niyazov renamed cities, streets, months, periodicals and public organizations after himself and family members and made a two-volume spiritual tome he wrote mandatory reading. Since Niyazov’s death, most of his formerly ubiquitous portraits have been removed from the outsides of public buildings. Berdymukhamedov has also ordered Niyazov’s name to be excised from the patriotic oath published in newspapers daily and repeated at the end of all TV news programs. Previous Post Previous Post UK IMMIGRATION BUREAUCRACY SO SCREWED UP THEY CAN’T EVEN DEPORT A FOREIGNER WHO WANTS TO LEAVE……! Next Post Next Post HAITIAN WOMAN WHO GAVE BIRTH IN ISRAELI FIELD HOSPITAL NAMES BABY ISRAEL…….